Dr. Warren Strickland has been a practicing cardiologist for over 20 years. He received his medical degree from the University of Arkansas in 1984. He completed both his residency and fellowship at Tulane University in New Orleans, Louisiana, where he was awarded the Outstanding Cardiology Fellow during his fellowship. 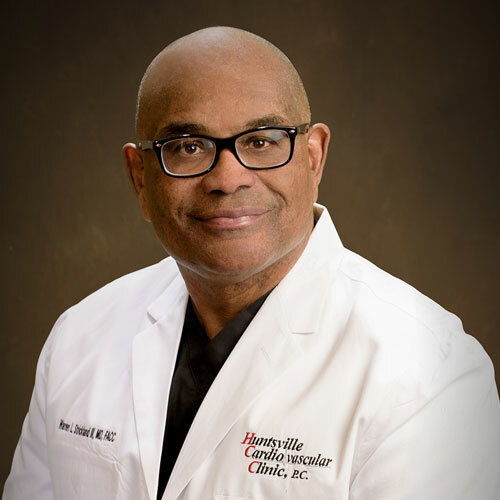 He is a board member of the American Heart Association and a member of the Association of Black Cardiologists. He is a fellow of the American College of Cardiology, the American College of Physicians, and American College of Angiography, and the American College of Chest Pain. He also served on the Huntsville Hospital Authority Board for 12 years. His specialties are very diverse and include: PFO/ASD Closure, carotid/coronary/peripheral and subclavian stenting, rotoablation, venous reflux radiofrequency ablation (RFA), and transcatheter aortic valve replacement (TAVR). Dr. Strickland is widely regarded in the field of interventional cardiology with numerous awards and recognitions. He has exemplified servant leadership in our community and in the field of medicine. He is married to Isabella Wofford Strickland, M.D., and they have three children-Matthew, Ashley, and Mary.